Its been a while since I last had a fashion review, I know. I am a fashion freak and the last time I had one of my crazy fashion sprees was directly after getting hitched. Now I have a brand new wardrobe that have never touched yet! Fall and spring wear, that may eventually go out of fashion soon, fashion collection wise (thank goodness for workplace). Lucky for the clothes, I'm the type of person who buys timeless pieces, to be worn over the years and still look good. Yep thats me. I've been named best dressed in university (probably because I rarely repeat clothes). A surprise, and its one thing I won't deny, I earned it because I know I'm a big spender when it comes to clothes. Its pisses my mother off, both because I never show her the tag prices and because she knows these shops I go to are too pricy like Alothman (hearts) and Thuraya Mall Ostora brand boutiques (double hearts). This is one sickness that is hard to cure. But at least it makes me happy. So whenever I get depressed I shop till I drop. 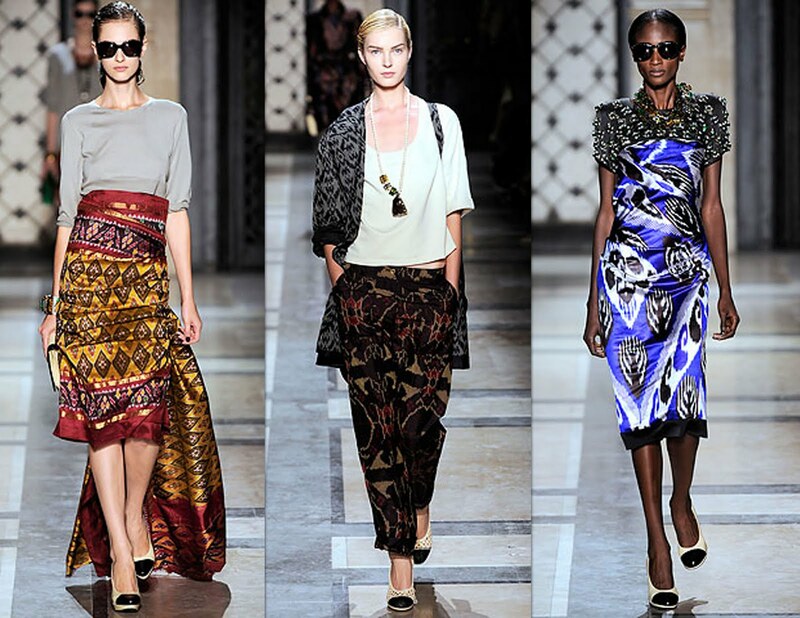 You know that one of this summer's trends is the tribal prints! I love them. 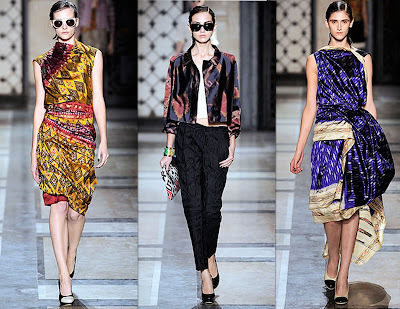 Usually I go for anything ethnic and tribal (although I hate prints, but these are an exception), anything "oriental" that is. And like I mentioned, I keep my extravegant pieces to be worn over the years, taking care of every piece for this very purpose, to wear it when it makes a comeback in any season. 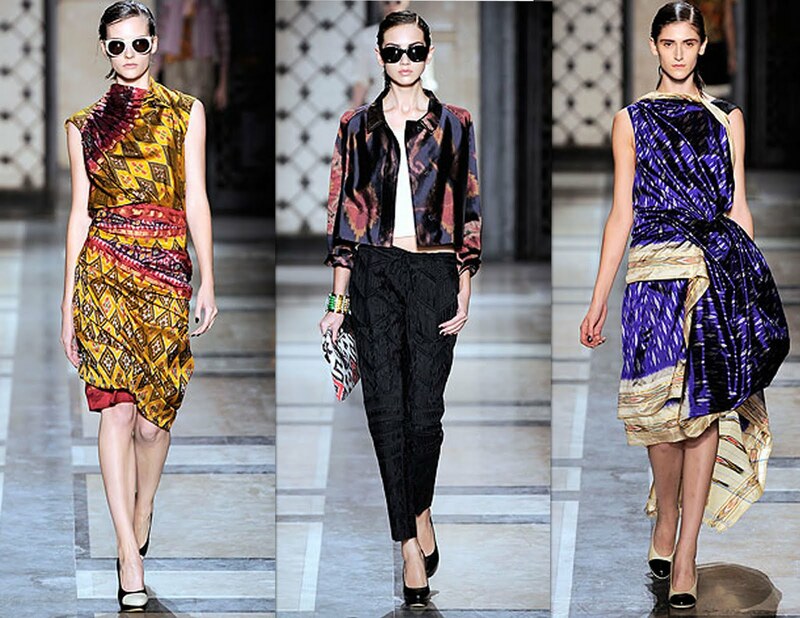 No one does the tribal this year like Dries Van Noten does! OMG I wouldn't normally go for the brand, although I like the fact that it can be worn by women of all ages, but for the sake of the trend the designs are spectacular. Leave you with the spring 2010 runway pictures. Other brands thats going with the trend include Diane von Frustenberg, Rodarte, Gucci, Alexander Mcqueen, Givenchy, Balenciaga, and Balmain, just to name a few. I love clothes too and sometimes i do spend alot on unique pieces that live forever and dont we all shop til we drop when we're depressed ;)?! I like the blue dress on the right down!